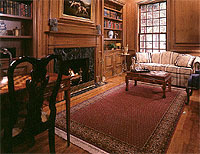 The David Mahoney Painting Company has been painting our home for the past 16 years. The first time they did a job for us, we saw “uncompromised quality” meant in a paint job. That job, and all of the jobs that came after it, looked amazing. Moreover, David and his crew do such high-quality work, they do not need to come back for years and years. This is where the true savings is — in the quality job. Thank you, David and company. David Mahoney worked for my company for three years and that time proved to be an excellent employee and professional painter. I’m sure he has carried these qualities into his new business and I feel confident that he will be successful in his endeavors. 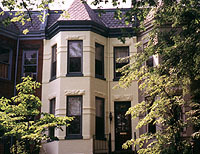 We are so pleased with the work you and your crew did for our Capitol Hill row house this month. Your own care and thoroughness in diagnosing our house’s needs was remarkable. The wall and ceiling repairs were done with craft, especially the handling of our beloved tin ceiling. It’s impossible to see where the water damage has occurred. The painting in the stairwell, bedroom, and front hall, too, was done with thoroughness and care for our possessions and cleanliness. The crew, Robert and Franceso especially were very attentive. When we decided to go ahead with more painting than we had expected, you were prompt with a reasonable estimate. Thank you so much for all the excellent painting you’ve done on the interior of my house for the past two years. It’s beautiful. I’m extremely pleased, and not only with the results. Your patience in the sometimes frustrating process of selecting colors, and your cheerful willingness to work at the job until I am completely satisfied, has made this endeavor, well, if not exactly fun, at least wonderfully gratifying. I have enjoyed working with you, and look forward to starting now on the outside of my house. I also want to say many, many thanks to Jim, Steve, and Ricardo, who actually did most of the painting. They, even more than you, have been in my house for days on end. It has been a pleasure to have them around. They have been routinely cheerful, efficient, quiet, and clean in their work. I have found them all to be just an excellent extension of your professionalism. This note is to thank you for the excellent work you did for me at my home. I would recommend you to your other customers if needed. I was impressed by the time spent on preparation before beginning the painting job as you know how important this is, and personally I would have never done it myself. This reflects on your professionalism and experience, which only comes with time and exposure to the trade. Once again thank you and please feel free to use me as a references. Our exterior paint job looks spectacular. Your painting crew painted things on the house that I didn’t even know needed to be painted. They did an outstanding job. We have had a lot of work done inside and outside our house over the past eleven years and I have never had a crew of men work in and around the house as clean, courteous and careful as those who worked here these last two weeks. I am glad to say, I found no collateral damage inside or outside the house as a result of the paint job. Also, Jim was very patient as I sampled four different green paints for the trim. Thank you for your outstanding work. I look forward to working with your company again. I just wanted to send you a note thanking you for the wonderful job you did painting my home prior to its sale last October. I received many compliments from prospective buyers and I am certain that the home’s appearance was a factor in its quick sale. Your service was quite professional, with great attention to detail. I would also like to compliment your prompt arrival each morning and the thorough clean up at the end of the day. I feel quite fortunate to have just a quality painting of my home and will recommend your services any time. Thank you once again. It is my pleasure to address the quality and performance of the painting done for me recently by the David Mahoney Painting Company of Clinton, Maryland. Mr. Mahoney and his crew were in my home last month to correct some very poor painting previously done in the upstairs and downstairs hallway and to repaint the living room. The latter area was very large and also involved repairing a damaged ceiling. Both areas were done superbly. I was impressed by the amount of time and attention invested in the preparation of the job. I have never seen walls and woodwork so thoroughly sanded and prepared for painting. The finished job has inspired me to think about new draperies to compliment it! Mr. Mahoney started on the date upon which we had agreed, and his crew reported on time each day. He also worked to accommodate me in scheduling part of the job to be completed prior to the holidays, the rest to be done when he returns in the spring to paint the exterior of my home. Dave was extremely helpful in selecting the colors used – not an easy task in the hall, since the paint he was working on was two years old. The young men who worked with Mr. Mahoney were careful in replacing furniture, re-hanging drapes, etc., and they were most courteous and pleasant at all times. They also cleaned up thoroughly when the job was completed. All in all, the job the David Mahoney Painting Company did for me was professional in every sense of the word; and, if I had to choose one word to describe it, that word would be ”meticulous.” I am looking forward to Mr. Mahoney’s return in a few months to complete the interior and paint the exterior of my home. The David Mahoney Painting Company recently painted the exterior wood and metal trim on my home. The job was done in a very orderly manner and was finished on schedule. The paint and other material used and the workmanship of all the painters were of the highest quality. I was impressed by Mr. Mahoney’s superior knowledge of his craft and the extreme care with which the men on the job performed their assignments. They kept the premises neat, and cleaned up very well when the work was completed. The best word to describe the total operation is “thorough”. I would not hesitate to recommend the company or to call David Mahoney again to help me in the future.